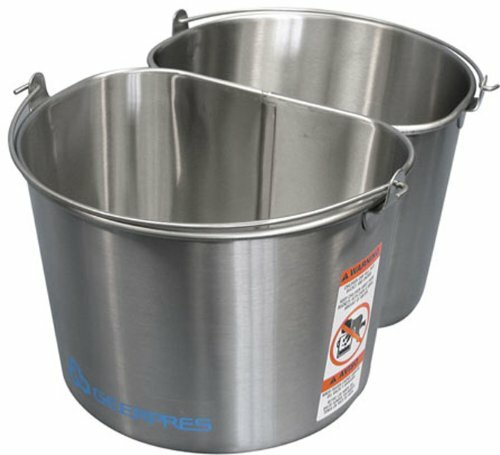 Two stainless steel half-round buckets designed to work as a pair with overlapping rim for mounting flat band wringer between buckets. Material: 304 stainless throughout, 22 gauge sidewalls and bottom with reinforced rim. Finish: #3 brushed finish. Capacity: each bucket 5 gallon capacity. Combined - 10 gallons. Excellent capacity. Two 5 gallon buckets used as a set: excellent capacity. Heavy-duty type 304 stainless steel construction: durable, with proper care will not rust or stain, retains clean attractive appearance, resists bacteria growth. Welded construction: nothing to loosen. Single bail: one hand carrying and easy emptying. Bail conforms to rim of bucket: easy lifting, reinforced rim. Tapered: can be nested for handy storage. Detent bottom: does not pop like an oil can. Overlapping rim: flat band wringers can be mounted between the buckets. Permanently etched graduations inside at 1, 2 and 3 gallon levels: for ease of mixing solutions. If you have any questions about this product by Geerpres, contact us by completing and submitting the form below. If you are looking for a specif part number, please include it with your message.